In this episode captain Drummond tries to find the killer of various people. All assassinations were provoked by a diamond of great value, but Drummond will face the danger. Drummond leads a black-shirted platoon of men from his former unit against foreign interlopers trying to pull England into dangerous overseas entanglements. Bulldog Drummond: Tenny, what rhymes with married? Tenny: Married, married? Harried, Sir! Bulldog Drummond: No, no, no Tenny, harried doesn't go with married. Tenny: You speak with the voice of inexperience sir! Some very hammy European bad guys interrupt Captain Drummond's wedding plans by kidnapping his fiancée in an attempt to lure Drummond into a ridiculous wild goose chase that sees our hero following cryptic clues for some reason or other. The plot is unimportant and wafer-thin; it's the ride that's fun. 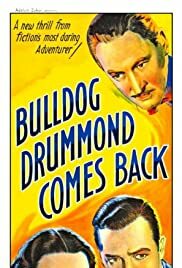 A very creaky, dated, no budget gem, Bulldog Drummond Comes Back is a fairly entertaining romp with engaging characters saying very quaint English things to each other, and generally cavorting about in various contrived circumstances. John Howard is good as Drummond. He's suitably dashing and charming, and he does a fine job. The supporting cast of good guys are all good value, and are blessed with frequently mildly amusing dialogue. The baddies are straight out of a Tin-Tin comic but that's not a bad thing in this case. The show is stolen by Barrymore, who, even though he never quite seems to be thoroughly enjoying himself in the role of Scotland Yard Detective Nielson, is always the best thing in the frame when he's on screen. His array of disguises (don't ask) are hilarious, and often ingenious. Overall a lot of fun if you're in the mood for some extremely lightweight, silly adventure comedy.